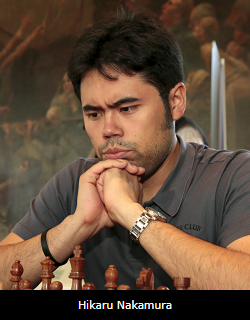 LONDON (December 17, 2018) � American Grandmaster Hikaru Nakamura defeated Frenchman Maxime Vachier-Lagrave in the London Chess Classic and Grand Chess Tour Final by the super-slim margin of 15-13 � the win of a single blitz game � after a nail-biting sequence of seven draws. Vachier-Lagrave began to suffer after he unwisely moved his queen to the kingside with 15�Qf5, when its lack of safety became a decisive factor. LONDON (December 17, 2018) � Gawain Jones on Monday ensured his victory in the British Knockout Championship with 2 Rapid wins over fellow English GM Luke McShane, taking him to an insurmountable 17-3 lead without any need for points in the Blitz portion of the match. In the first Rapid game, McShane � desperately needing a win to get back in contention, played an unsound knight sacrifice in the hopes of levering open the kingside. Jones refuted the sacrifice, wrapping up efficiently, and despite some nervy play in the second game, only once looked in danger when McShane could have tried to mix it up by opening files against the king. Accurate defensive play and good endgame technique once again featured in the second Classical Game of the London Chess Classic Final, with Hikaru Nakamura and Maxime Vachier-Lagrave drawing after 53 moves of an evenly-contested Ruy Lopez Berlin Wall variation. As in Game 1, Black demonstrated full equality in a well-trodden main line of the queenless middlegame, leaving the players to dispute the merits of an ultimately level endgame that had elements of asymmetry, but not enough imbalance to create a serious advantage for either side. MVL�s 22 e6!? effectively led to simplification and further accurate play by both players ensured the draw. Gawain Jones on Sunday stormed into a 6-point lead in the British Knockout Championship Final, dispatching Luke McShane with a neat combination starting with 25 Bxf7+ that left his fellow English GM a pawn down with a hopeless position. France�s Maxime Vachier-Lagrave and American Hikaru Nakamura split the honours in a keenly contested Main Line Grunfeld in Game 1 of the London Chess Classic Final, the concluding event of the Grand Chess Tour, which was played at the Olympia Conference Centre. The result ratchets up the tension for Game 2, which will be broadcast live from 14:00 UTC on Sunday, as a win would give a lead of 6 points going into the Rapid and Blitz portion of the match on Monday. In the Third Place Playoff match, Levon Aronian challenged Fabiano Caruana strongly in an Italian Game, but the players acquiesced to a draw by repetition as Caruana neutralized Aronian�s initiative. Game 1 in the British Knockout Final and Third Place Playoff matches also finished in well-contested draws. It�s 9:00am on Friday, December 14 � and for now, all is peaceful at the London Chess Classic. World top players Fabiano Caruana, Hikaru Nakamura, Maxime Vachier-Lagrave and Levon Aronian are enjoying a rest day after their exertions the day before in six nerve-shredding games of Rapid & Blitz to decide the Grand Chess Tour Semi-Finals. Maybe they�re still sleeping, or just waking up for a day of quiet preparation before the action starts again on Saturday, December 15: Day 1 of the 3-Day Final (and Third Place Playoff), when big money, honour and the top spots in the world rankings will be at stake. Hikaru Nakamura and Maxime Vachier-Lagrave qualify for the London Chess Classic Final, the concluding event of the Grand Chess Tour, after a pulsating day of Rapid and Blitz, beating Fabiano Caruana and Levon Aronian, respectively. Nakamura and MVL both take the lead in the Rapid games, then clinch their places in the Final with blitz victories. The British Knockout Semi-Finals, also taking place at Google DeepMind�s offices in London, are won by Luke McShane and Gawain Jones. McShane�s surprise win over Mickey Adams comes despite a valiant fightback by the England No. 1, who won three blitz games in a row to stay in the match. The Grand Chess Tour and British Knockout Finals and Third Place Playoffs take place from Saturday to Monday at Olympia London. Live coverage of the London Chess Classic & British Knockout Championship starts at 14:00 UTC. 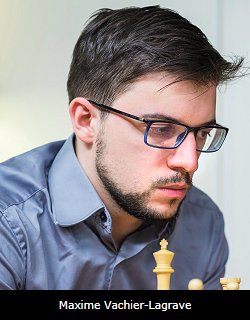 Both Semi-Final matches in the London Chess Classic see draws on Day 2, leaving Fabiano Caruana & Hikaru Nakamura, and Maxime Vachier-Lagrave & Levon Aronian, all tied with two draws each. The Semi-Finals go into a third and final day on Thursday, consisting of 2 rapid and 4 blitz games, with a total of 15 points required to secure qualification to the Final. Each Classical game in the match counts for 6 points, each Rapid game counts for 4 points and each Blitz game for 2 points. Should matches still be tied, rapid playoffs and then an Armageddon game will decide. In the British Knockout Championship, Gawain Jones defeats David Howell with a daring bishop sacrifice. Meanwhile, Mickey Adams is thwarted by dogged defence from Luke McShane, who holds a fortress to draw. Live coverage of all matches can be viewed here from 14:00 UTC: London Chess Classic & British Knockout Championship. World Championship challenger Fabiano Caruana is held to a draw by Hikaru Nakamura in the first semi-final game of the London Chess Classic, the final leg of the Grand Chess Tour, despite coming close to a decisive kingside attack on multiple occasions. 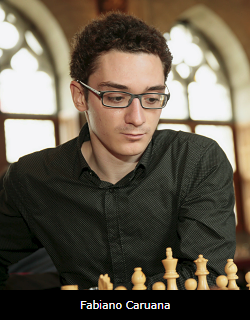 The result leaves Caruana still just short of World Champion Magnus Carlsen�s No. 1 spot on the live ratings. Levon Aronian presses Maxime Vachier-Lagrave immediately after a queen swap, but the Frenchman soon reaches a drawn endgame. In the accompanying British Knockout Semi-Finals, Luke McShane forces a perpetual after mounting a strong counter-attack on Mickey Adams� king. Fabi�s Back: This Time It�s a Knockout! Fans eager for more fabulous top-class chess after the World Championship in London need look no further than the London Chess Classic, where the valiant challenger, Fabiano Caruana, will be back in town for a showdown with three of the world�s most exciting players from December 11-17, thanks to support from our new sponsor, The Lohia Foundation. With an exciting Semi-finals and Final format, complete with Classical, Rapid & Blitz, plus a nail-biting Armageddon decider, the London Chess Classic will pit Fabi against fellow American Hikaru Nakamura, Armenia�s Levon Aronian and France�s Maxime Vachier-Lagrave (MVL) in the finale of the 2018 Grand Chess Tour. The fantastic four will be dueling for a total of $300,000 (�230,000) in GCT prize money. Just how Fabi will come back after his narrow loss (tied 6-6 in Classical, 3-0 in the Rapid playoffs) in the World Championship match against Magnus Carlsen will be the question on everyone�s lips � as his opponents are likely to face more of the superb opening preparation that Fabi displayed there. The London Chess Classic�s 2018 Pro-Biz Cup was won for the third time by Rajko Vujatovic, this year partnered by English GM David Howell in a prestigious pairs event charity fundraiser. The Pro-Biz Cup is a chess tournament like no other � the world�s best grandmasters competing alongside leading businesspeople in a meeting of minds � all in the super-cool surroundings of Deep Mind�s offices at Google HQ near King�s Cross in London. England top 4 Mickey Adams, David Howell, Gawain Jones and Luke McShane all negotiate their way through a tough quarter-final stage to qualify for the British Knockout Championship semi-finals. David Howell triumphs eventually over IM Ravi Haria in a rapid playoff, despite almost coming to grief in the first Classical game. Semi-Finals pit Adams vs McShane and Howell vs Jones. Live coverage of the Semi-Final matches, starting Tuesday at 11:00 UTC, is available on the London Chess Classic website. Chess in Schools and Communities will be running a week-long Schools� Festival as part of the 2018 London Chess Classic at Olympia London from Monday 10th to Friday 14th December. The big question is: After going 12 rounds with Magnus, just how will Fabi fare against some of the most dangerous hitmen in world chess? Will he be buoyed by victory or desperate to take out the pain of defeat on his rivals? ... read more. Book your place at the 2018 London Chess Classic: Enter online today! Join us at the epicentre of world chess � for a very special 10th London Chess Classic from December 9-16, 2018. With London hosting what promises to be an epic Magnus Carlsen-Fabiano Caruana World Championship match in November, just days later chess aficionados are in for a double treat with the exciting finale of the Grand Chess Tour being fought out at the London Chess Classic, in a knockout format for the first time and with $300,000 at stake. The semi-final battles, which will feature the 4 top players from the Grand Chess Tour qualifying events in Paris, Leuven and St. Louis, will be hosted by the pioneering artificial intelligence company, DeepMind, at Google�s London headquarters. Then the action moves to the London Chess Classic�s traditional venue, Olympia London, for the final ... read more.